I modified a regular box cooker made of cardboard with glazing area of 15in x 12 in with a large panel to boost the power into the box. Box cookers have been immensely popular because of simple construction and low cost when made with cardboard.They have been tested widely since the early work of Barbara Kerr and others. Can we improve upon that design? The panel is made of cardboard lined with aluminum foil Reynolds heavy duty kitchen foilwhich was positioned surrounding the glazed window. I pasted the panel,almost vertically, with packing tape to the box--like a semicircular sheet. My effort was to reach the inside temperature of 250 F or higher even on marginal days with intermittent clouds and also increase the heating rate. Today I could reach 250 F in about 30 minutes with a load of about 200 grams of lentils in a blackened container. The maximum temperature was 280 F. Yesterday it was cloudy and windy and yet 250F was reached. The panel may also reduce the effect of wind on the box. I have used a minimum of bottom insulation, with loft insulation and cardboard pieces.The tray holding the container is plain aluminum baking tray. It is hoped that this design, combining the features of box cooker and panel cooker similar to 'Cookit' cooker will enable greater use of box cookers with faster cooking, compared to normal box cookers. Greetings Again NK,and thank you again for another great contribution. Thank you for all of the detail and work you put into the experiments and the description of your work. 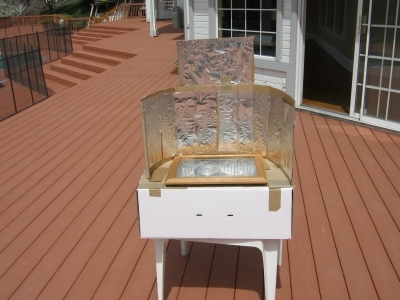 I like the design you used for your solar cooker, it made me think of what might be possible using a box cooker and a solar trough cooker combination. I am glad your design worked out well. Great information for our site visitors.